Idea and realization: Workgroup Chto delat/What is to be done? Many thanks to all the artists, authors, translators and photographerswho supported this publication. We would like to express our gratitude to Kirill Krutikov for his financial support of this issue. This publication is a contribution to documenta 12 magazines, a collective editorial project linking worldwideover 70 print and on-line periodicals, as well as other media. …if the implementation of a liberating education requires political power and the oppressed have none, how then is it possible to carry out the pedagogy of the oppressed prior to the revolution? This is a question of the greatest importance, one aspect of the reply is to be found in the distinction between systematic education, which can only be changed by political power, and educational projects, which should be carried out with the oppressed in the process of organizing them. How do people shape their surroundings? Which points of reference guide their development? Which potentiality do self-organizing structures entail? How should they structure their relationships to existing institutions? Could they ever replace traditional forms of education? Or can they place enough pressure on institutions to make them get involved in the (auto)didactic process? Chto delat/What is to be done? /// An exhibition project: Strategies for Self-Education. the project is accompanied by a series of discussions, seminars, workshops and video screenings. 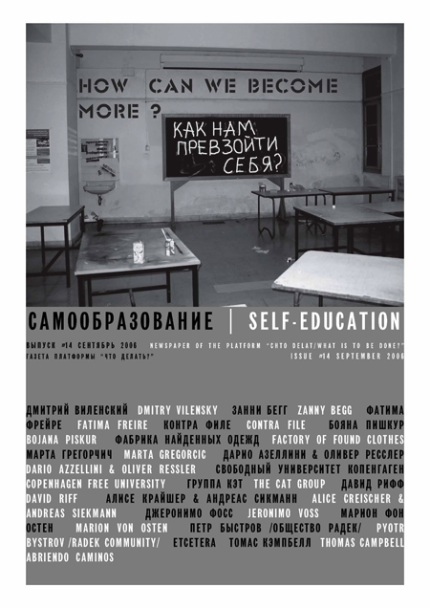 In the frame of the project a new issue of the newspaper “Chto Delat?” – “Self-Education. How can we become?” more is published. 1. The theme of self-education flows from the notion of self-organization. What do we mean when we talk about this notion today? Self-organization is a collective process of taking on political functions and addressing tasks that have been excluded from the field of real politics or pushed out of public space. Thus, the process of self-education is inseparable from the positioning of collective dissent with the existing order of things. It demands the transformation of the status quo. Self-organization searches for a form to express the voices of dissenting subjectivity. The Karl Marx School of the English Language (KMSEL) was founded in January 2006. Its most immediate goal was to improve both the spoken language (pronunciation, discussion) and reading comprehension of its participants. I serve as the “instructor” (native speaker and art historian Kristin Romberg is the substitute teacher when I am unavailable). The “students” are the philosophers Oxana Timofeeva, Alexei Penzin, and Vlad Sofronov, the curator Konstantin Bokhorov, and the artist Dmitri Gutov. The school meets once a week at Gutov’s studio in the center of Moscow. Meetings last between 3-4 hours, with one cigarette-and-tea break, and usually end with a drink or two at a local bar. Our project began as a seminar with five girls, at which we discussed key words from a quote of the Brazilian educator Paolo Freire. The seminar resulted in a video and a collection of clothes dedicated to these phrases. The clothes were made by the girls, as in the basic principle in most projects by the FNO Shop of Utopian Clothing. Girls are always sowing something. Or embroidering. Or even just sowing on buttons. By making dress backs and cuffs, they create their own new image, or to be more precise, a form for their own ideal. These seamstresses are very serious: their goal is give form and boundaries to something that is only still showing through as a vague contour, a plump cloud of desires, urges, questions, yearnings, and all the rest – garbage and ideals. The field of education that contains the most interest and potential is that which grounds knowledge, and self-knowledge, in the practices and lived experiences of the oppressed outside the framework of the professions and the academy. In this sense self-education is not the individual completion of a university degree, the gaining of a place in the academy, nor even the mastering of a particular self-directed body of knowledge (useful though all these processes may at times be) but rather the process by which the individual is able to participate in a collective process which challenges the violence of the relationship between the commodity form and the comodification of consciousness. As Marx points out this disjunction is breached when “man is lost to him-self but at the same time has acquired a theoretical consciousness of this loss, and is driven by the absolutely imperious dictates of his misery – the practical expression of this necessity – which can no longer be ignored or whitewashed, to rebel against this inhumanity” . When I was a schoolboy, I took part in an experiment in intellectual emancipation. Although our town on the Minnesota prairie was small, we had a fairly progressive school. The era’s contradictions found expression in its architectural form: prison-like on the outside, on the inside it featured open-plan classrooms. The school, I later realized, also served as a refuge for the era’s victims: ex-hippies, draft resisters, potheads, closeted gays—our teachers. Having failed to liberate themselves, they set to work on us. Especially fortunate in this regard were those farm kids they considered “gifted.” With the aid of spooky metal contraptions outfitted with a mirror that directed a beam of light at variable speeds down a printed page, we taught ourselves to “speed-read.” We were permitted to read whatever books we liked. I speed-read Crime and Punishment and became forever liberated for a place and a language that back then (at the age of twelve) I could hardly believe existed. Error is a negative affirmation, or a speculation about another possible outcome. Traditional education teaches by examples; it uses error as a variable to measure knowledge. In traditional education error would be eliminated. Sanctioning, in a way, that which passes through the experience of error. On one hand, it attempts to minimize to the maximum degree the idea that error is something positive, while, on the other hand, it lives off of the dialectic of trial and error in order to constitute the very matrix of the educational system. When a child in school “is wrong,” he or she will be (depending on the guide at his or her side) encouraged, punished, ostracized, or criticized. In this society and educational system error condemns. But for the Errorists the experience of error is the experience of knowledge. So knowledge and experience are acquired, lived, and transmitted, like it or not, through the experience of error. Over the last one and a half years, I have had the chance to collaborate closely with the Italian curator and critic Marco Scotini and, on frequent visits to Italy, to communicate with the Milan-based artist-group Alterazioni Video. As the dean of visual art at the New Academy of Fine Arts, as a critic and teacher, Marco prefers forms of interaction that are as practical as possible. In his classes and workshops, those who teach enter into close communication with students. For example, the workshop of the Radek Community was exclusively structured around “the exchange of experience;” this experience included a discipline that could be called “contemporary living,” ranging from the day-to-day problems of a young person’s self-identification to provocative “political” actions. A.C. Could you briefly explain what sparked the student protests in Germany this summer? Could you describe the situation in higher education? J.V. The current situation at German institutions of higher education is largely determined by measures taken to restructure the entire educational system. It includes the introduction of tuition fees, and the implementation of programs for the BA and the MA. More and more graduates are being trained to only satisfy the job market, while a small “excellent” elite still receives interest-based support from business. Department on subjects that are socially relevant but unlucrative are simply being closed. The definition of content through neoliberal criteria basically forebodes the end for all critical science and scholarship. Since the summer of 2005, more and more students all over Germany have been putting up resistance, most of all against the federally organized tuition plans. May 2006 saw the rise of a new wave of student protest. It was triggered by the imminent passage of legislation to introduce general tuition fees of at least 500 € per semester, in addition to administrative fees that are already in effect. The state government of Hesse is even planning to institute a special charge of up to 3,000 € a year for “educational foreigners” (i.e. non-EU-citizens with non-German-higher-education-diploma). With the current reforms, “equal opportunity in education,” with its seemingly invisible structural exclusions, is becoming lawful social discrimination. But most importantly, the idea that you as a student would have 1,000 € less per year supplied the necessary protest potential for a “summer of resistance”. All the more because it is clear to everyone that the general introduction of fees bring step-by-step increases in tuition in its wake. ExArgentina found its thematic starting points in the economic crisis and uprisings in Argentina in December 2001. The project lasted for four years, giving us a span of time much longer than the usual haste with which exhibitions and cultural events have to be managed, providing a continuum that provides the precondition for truly critical, complex artworks. The project consisted of several stages: from November 2002 to May 2003 we stayed in Buenos Aires, where we met various groups and artists and started a process of cooperation and discussion, which was to last four years. In the fall of 2003, we returned to Berlin and organized the conference “Plans for Leaving the Overview.” The conference was intended to discuss the theoretical and methodological issues that had so far crystallized with people from Europe as well. It was followed by the exhibition “Steps to Fleeing from Work to Action,” which was shown at the Museum Ludwig in Cologne in March 2004. Part of the exhibition was also shown in September 2004 in the exhibition “How Do We Want to be Governed” at a Centro Civico in in Barcelona. This spring, the final part of ExArgentina took place in Palais de Glace, a city institution in Buenos Aires, and was organized by the Argentine artists, who brought in many new artists and groups. This last part of the project consisted of an exhibition and a 6-week workshop, in which issues important to the project were now discussed in the light of the current political situation. Schools always teach us to obey our teachers. All schools, colleges, academies, institutes, and universities that teach us to march and walk straight ahead have long since forgotten themselves; they have forgotten where knowledge is to be found. Now, they give us lessons on how to survive contemporaneity, how to outlive the end of history, how to cope with the logic of capital. At school, people learn to make money and how to satisfy their needs. A motor running in the background.